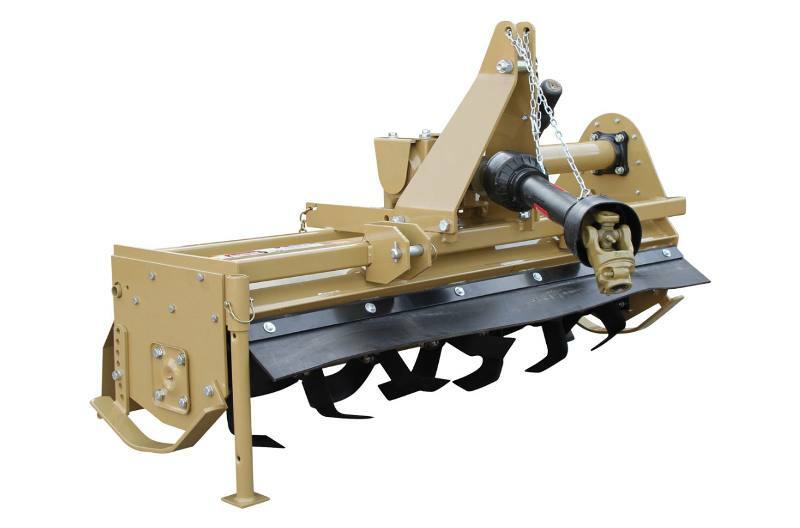 The RTR12, and all Land Pride reverse rotation tillers, tends to achieve greater depth of penetration, moving and pulverizing more soil in the process, while burying residue as opposed to leaving it on top. The solid steel shaft provides extra strength to the rotor and the RTR12 offers offset capabilities, allowing the tiller to work closer to objects such as fence lines, buildings and trees. 6-1/2” Digging depth: For deep soil penetration. Formed and reinforced rear deflector: Keeps dirt in and leaves a level finish. Forming gives deflector additional strength. Adjustable deflector allows for various finish results. 15” Rotor swing diameter: For deep tilling and turns the soil over faster. Width, end plate to end plate: 42"
Sideshift dimensions centered: 16" - 26"
Shifted right: 16" - 26"
Shifted left: 23" - 19"